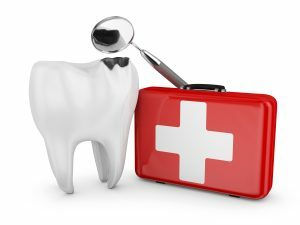 Advice On Common Emergencies From an Emergency Dentist in Temple! It’s an unfortunate fact of life that accidents, mishaps and emergencies happen when you least expect them. Not only is it inconvenient to deal with these situations, it’s potentially painful as well. In fact, if you’ve ever found yourself in a dental emergency, you know that the only thing on your mind is getting out of pain as soon as possible! The first step is always to call an emergency dentist in Temple, but it’s still helpful to know how to manage the most common emergencies at home until you can get dental care. Below you’ll find some great tips to help you prepare for these unexpected situations as much as possible! If you’ve broken a tooth while eating a meal or it’s simply cracked on its own, start by rinsing your mouth out with lukewarm water. If you find any large pieces, put them in a small plastic bag to bring with you to your appointment. If you’re in pain, you can apply a cold compress to the outside of your mouth and take over-the-counter pain medication. Also, if you have a sharp edge that feels uncomfortable, try using dental wax from the drugstore to cover it. If you have a persistent toothache, abscess or swelling, you might have an infection. It’s recommended that you seek immediate treatment because it can spread to other areas of the body and become dangerous if it’s left untreated. After calling an emergency dentist to schedule an appointment, swish with lukewarm salt water every few hours until you can be seen and take over-the-counter pain medication as directed. For a knocked-out tooth, time is of the essence! A dentist will have the best chance of saving your tooth if you can be seen within one hour. It’s also crucial that you handle the tooth properly until you get to your appointment. Start by gently rinsing it off (holding it only by the crown, not the root) and place it back in its socket, facing the right way. If this isn’t possible, put the tooth in a glass of milk or water, or, as a last resort, hold it in your cheek pouch. The most important thing is that the tooth stays clean and moist! Whereas you should call an emergency dentist right away for the above situations, there are certain circumstances that require immediate care from a medical doctor. For example, if you have heavy bleeding that doesn’t subside after applying pressure for 15 minutes, go to the nearest ER or urgent care center. Also, if you think that you’ve broken your jaw, go the ER right away. After you’ve been stabilized, you can call a dentist to find out if any restorative work needs to be done. Dental emergencies are never pleasant to deal with, but with these guidelines, you’ll be able to handle them as effectively as possible! Dr. Richard Fossum is a general and emergency dentist in Temple who makes emergency care a priority in his practice. He knows how alarming it can be to have a dental emergency and his reassuring manner can put even the most frazzled patient at ease. If you have any other questions, he can be reached via his website or at (254) 778-3900. Comments Off on Advice On Common Emergencies From an Emergency Dentist in Temple!